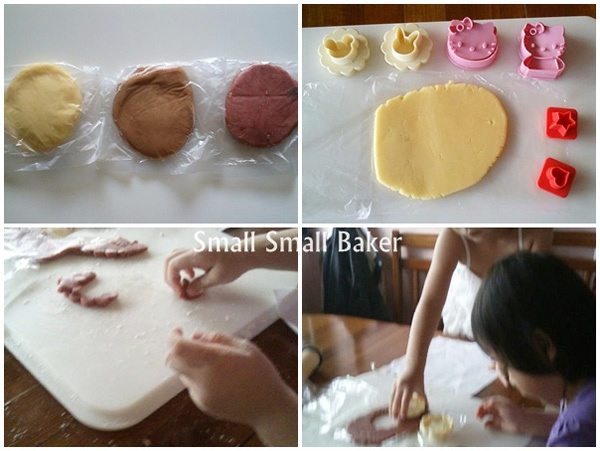 Today, I have a guest post from Sze Nee who blogs about baking at Small Small Baker. I’m so glad that she willingly accepted my invitation to write about having fun baking with children. She also bakes for events and parties. I have been invited by Dee of PruneNurture to write a guest post for her blog. Dee was my secondary school classmate and we were very good friends then. We lost touch for a few years and found each other on Facebook. She is now married with a very cheerful and active little girl, Dot. She now blogs about her parenting experience and the growing journey of her girl. Her blog is also one of the finalist for the Nuffnang Asia-Pacific Blog Awards 2011 for the Best Parenting Blog. When she invited me to do a guest post for her, I agreed immediately. Since her blog is about children and parenting, I decide to share a recipe that parent and child can bake and bond together. Here’s a simple butter cookie recipe. I use natural ingredients to make different coloured doughs. You can use any cookie cutters you like or use your own creativity to make any cookies that you can imagine. 1. Using a hand whisk, whisk butter until smooth. Add in sifted icing sugar and whisk until well-mixed. 2. Slowly drizzle in egg and whisk until well-mixed. 3. Add in sifted cake flour and ground almond, fold the mixture with a spatula or a large spoon. Press to combine and form a dough, do not knead or overmix. 4. Wrap the dough in a plastic bag or cling wrap, put the dough in the fridge for about 1 hour. Optional: If you want coloured cookies, divide the dough into 3 portions. Add cocoa powder/green tea powder/red yeast powder to each portion of the dough, knead well and wrap separately. 5. Remove the dough from the fridge, roll the dough into 5mm thickness. 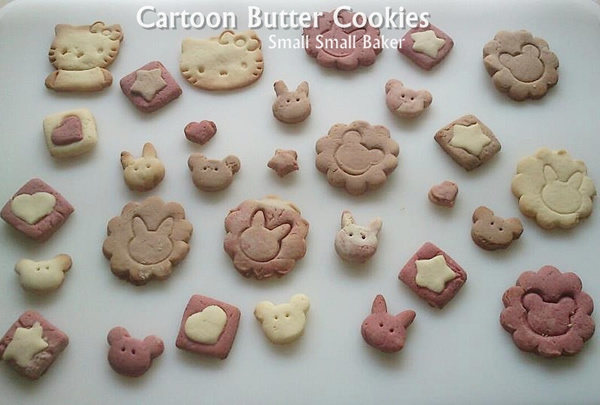 Cut the dough with your own cartoon cookie cutters. 6. Preheat the oven to 180 deg C. Bake in oven for about 10 minutes or until light brown. Cool the cookies on a rack and store them in airtight container. What a wonderful recipe and learning experience for the children and adults alike! Thank you, Sze Nee from Small Small Baker.